The Jeep Compass is a fun, sporty SUV that combines the handling, fuel economy and performance of a compact car with the usability and functioning of an SUV - all at a very affordable price. 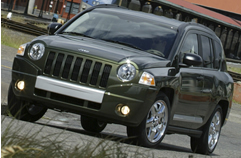 The 2009 Jeep Compass comes in two models the Jeep Compass Sport and the Compass Limited. The Compass features a surprisingly roomy interior that combines comfort, versatility and functionality. The rear seats fold flat to give 53.6 cubic feet of cargo space an available front passenger seat that folds forward to create a flat surface increases that space to 60.7 cubic feet. Some features have received a new freshened look for 2009 such as the new instrument panel design complete with chrome accents. A newly designed center console with a split lid for additional storage room and LED-illuminated cup holders. The Vinyl load floor from last year's model has been replaced with a carpet load floor for 2009. The exterior of the Jeep Compass has many of the distinct features Jeep is known for such as the round headlights and the unique seven-slot grille. While the lines and aggressive body stance suggest toughness and durability the overall shape is also more sleek and sophisticated than traditional Jeeps. The fuel economy is very good for a SUV, standard on all models is a 2.4 Liter DOHC I4 with 172 hp engine that gets between 21 and 23 city miles per gallon and 24 to 28 highways miles per gallon depending on which transmission is selected. A 3.0 Liter DOHC 158 hp I4 is available on the Compass Sport. Both the Sport and the Limited come standard with a Five-speed transmission with a Continuously Variable Transaxle (CVT2) with Auto Stick available as an option. Standard are many features such as an Electronic Stability Program (ESP), an Electronic Roll Mitigation (ERM), advanced multi-stage driver and front-passenger air bags, side-curtain air bags, brake traction control and Anti-lock Brake System (ABS) with rough-road detection. Get a Free Price Quote on a Jeep Compass.